On the San Juan de La Rambla route you will discover a small town that manages to marry all the tradition and charm of the past with the present. It is a route full of contrasting landscapes with natural areas of great value, small rural villages and urban areas full of history. The geographic relief of this town is deeply marked by the Barranco de Ruiz, the natural boundary with the neighbouring municipality of Los Realejos, and which encompasses numerous gems of nature. You will become familiar with traditional tracks that criss-cross it and can admire breathtaking views at every turn as you discover a unique landscape. The origins of San Juan de La Rambla are to be found in aboriginal times, but it was not until after the conquest of the Island that the present communities in the municipality began to form. Agriculture has been part of local life since those beginnings, constituting as it does a fundamental part of its economy. 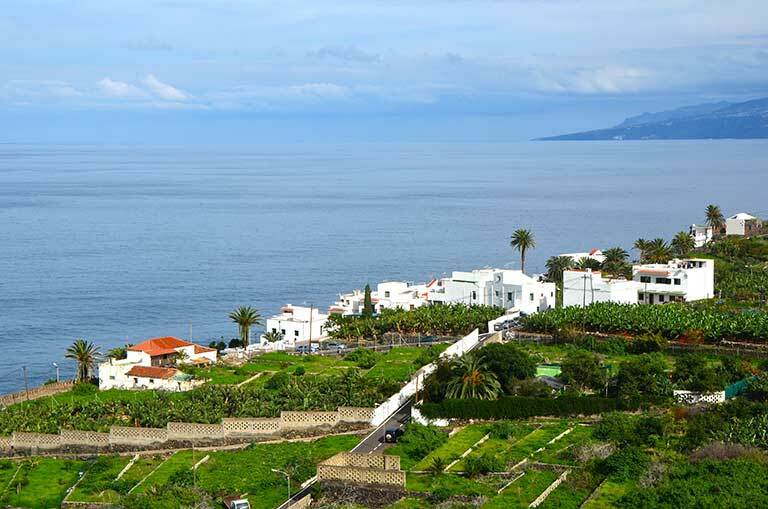 The way the agricultural landscape has been preserved gives you an idea of present-day rural reality, in which crops such as bananas on the coast, with potatoes, vines and vegetables on the middle slopes, accompany you throughout the tour. Here we should mention the cultivation of Italian arum, a popular tradition in the fishing village of Las Aguas. This plant has a rhizome (in fact poisonous) that after a laborious treatment process produces a natural remedy for stomach ailments. 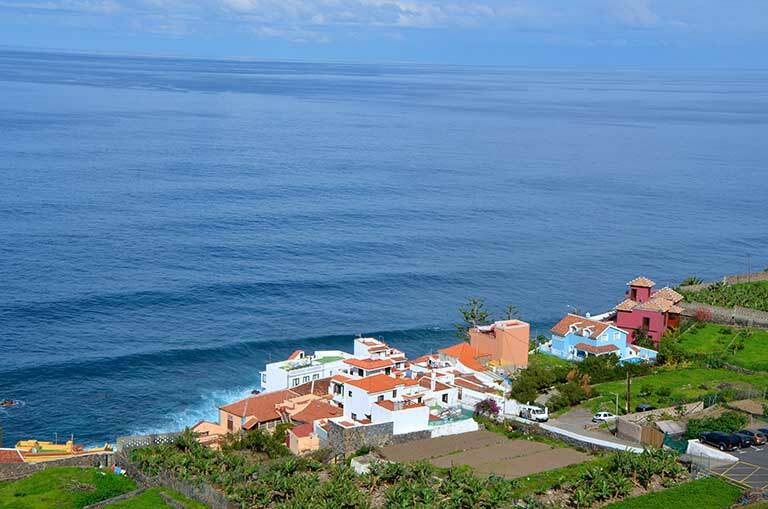 Down in the coastal districts you will see populated areas that invite you to take a stroll among banana trees and admire the beauty of the Atlantic Ocean and the vistas of the north coast of the Island. The villages are of great historical importance, in which notable examples of religious and civil architecture stand out. In the middle slopes, the fields still cultivated merge with present-day residential areas, where examples of traditional rural architecture stand side by side with more recent constructions. It is worthwhile stopping to admire the magnificent views that can be seen from different points and which provide the opportunity to see at first hand a fascinating area, dominated by deep ravines and get to know bustling villages that are home to a rural past, still alive today. The first written mention that we have of the neighbourhood of La Rambla, also known as El Rosario, dates from the XVIth century. This is indeed a picturesque neighbourhood, located on the ocean front on the coast belonging to San Juan de La Rambla, just near the mouth of the Barranco de Ruiz. It is located in a verdant setting, with lush vegetation and cultivated plots. Surrounded by banana trees, it makes a charming rural scene. 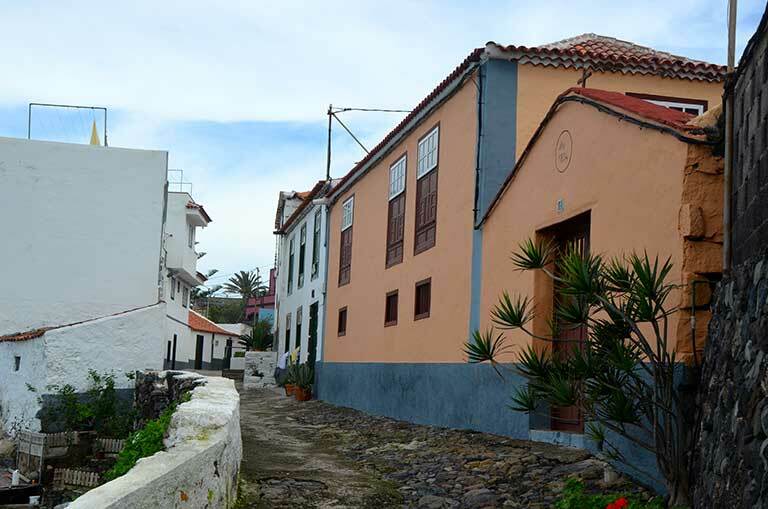 Its small streets and houses, some centuries old, tempt visitors with the opportunity to walk around and relax while contemplating marvellous views overlooking the sea. It has some magnificent buildings which are examples of traditional architecture and the Chapel of Our Lady of the Rosary, whose origins go back to the XVIIth century. The chapel is located on an estate, at present the property of the Dorta Domínguez family and is characterized by its small floor plan, its tiny choir and an altar with a picture of the Madonna of the Rosary. 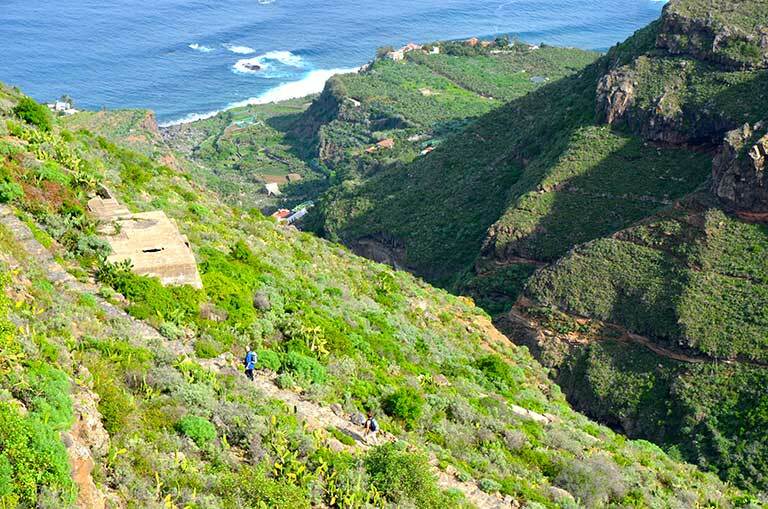 Having come this far, it is worthwhile getting to know the neighbouring village of Las Aguas by following the coastal path which used to be the old "Royal Highway". 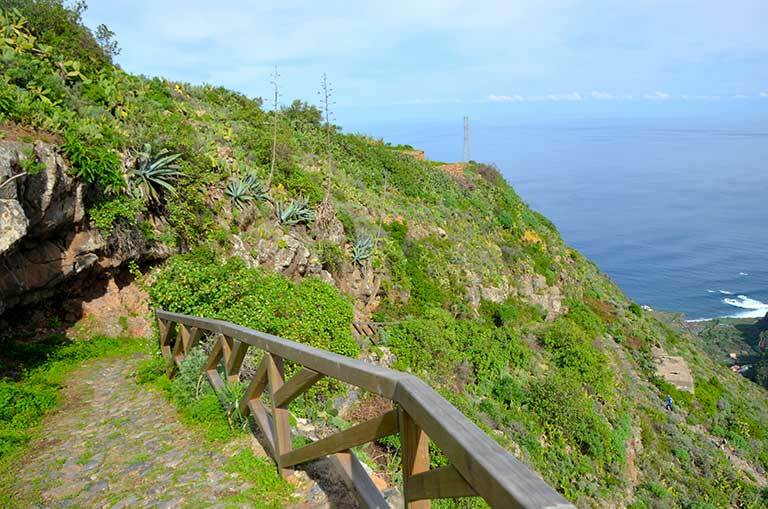 The bridle path, which still has sections with stone walls, runs along the coast and you can see farm plots, banana plantations and stands of Canary tamarisk, canes and agaves. The route is easy, fairly level and only short, and reveals the hidden corners of San Juan de la Rambla. Among the many attractions of San Juan de La Rambla is its historic centre, whose degree of conservation and the typical village that it represents have earned it the title of a Site of Cultural Interest. Many buildings of great historical and artistic value remain well preserved. 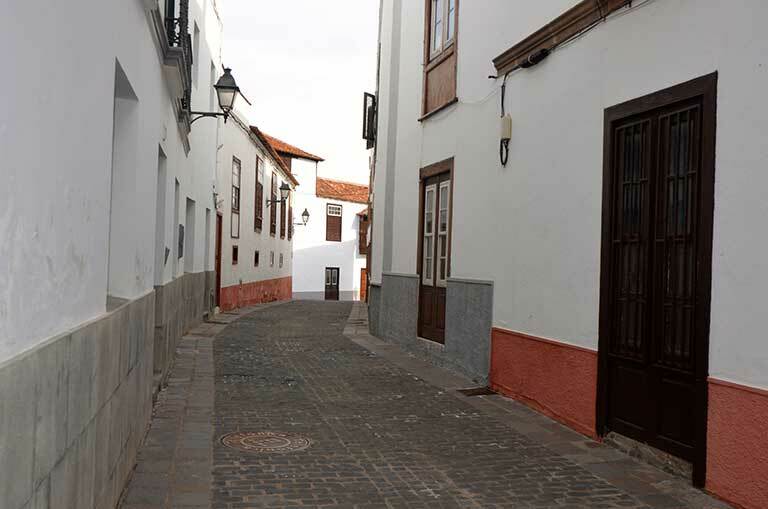 The visit runs through streets and alleys in which you discover part of the historical and cultural legacy of this corner of Tenerife. Its origins are linked to the period immediately after the conquest of the Island when the land was divided up among the conquerors and the later arrival in the area of Spanish and Portuguese settlers. 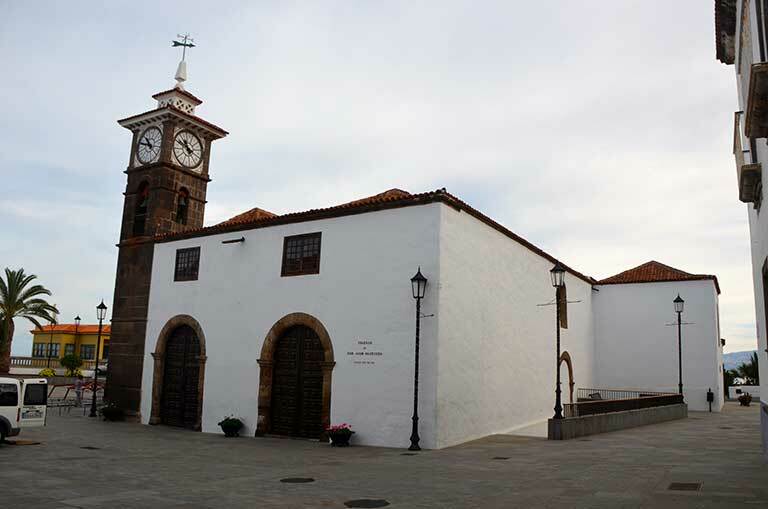 Martín Rodríguez, a Captain of Portuguese origin is considered to be the founder of the town and was the one who built the Church of San Juan Bautista in the XVIth century. Notable among the various misfortunes that have befallen the town is the storm that struck in 1722 and affected many buildings, including the church. This is a town that has retained much of its heritage and in which buildings such as the Church of San Juan Bautista (St. John the Baptist) rank among the foremost. The shrine consists of two naves; the second houses the old chapels of the Rosary and Mercy, which retain their original coffered ceilings. As well, the altarpieces deserve a special mention, being of great artistic value, most of them in baroque style and beautifully coloured. 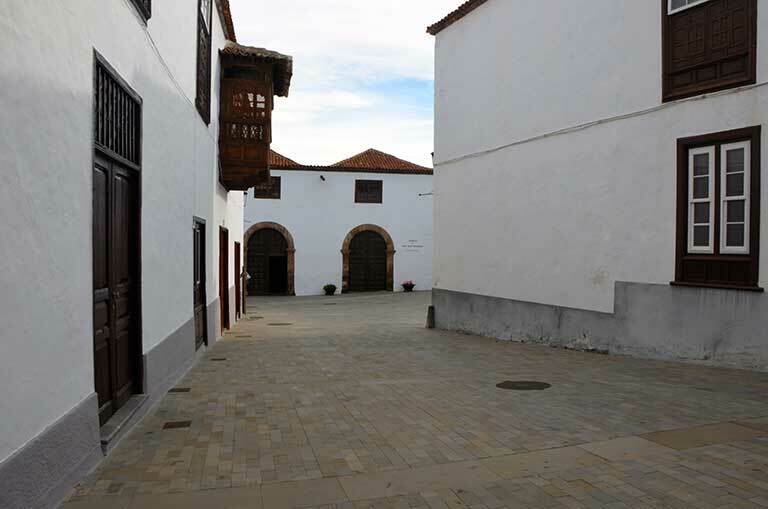 Another building of considerable interest is what was formerly the Alhóndiga**, a place used for storing grain which later became the first town hall. It has two floors, the upper one being a grain store, while the lower was the meeting room, the gaol and other ancillary rooms. The vicissitudes of history and various alterations have transformed the property, so that original elements barely remain. Today, the ground floor of the building houses administrative offices while the upper floor has been converted into a cultural centre. Among other noteworthy buildings, we should mention the family home of the Oramas, situated opposite the church, remarkable for its beautiful balcony on the facade; the house of the Alonso del Castillo family from the XVIIIth century and also standing on the square, and opposite the former alhóndiga**, the house of the Delgado Oramas family, dating from the third quarter of the XVIIIth century. 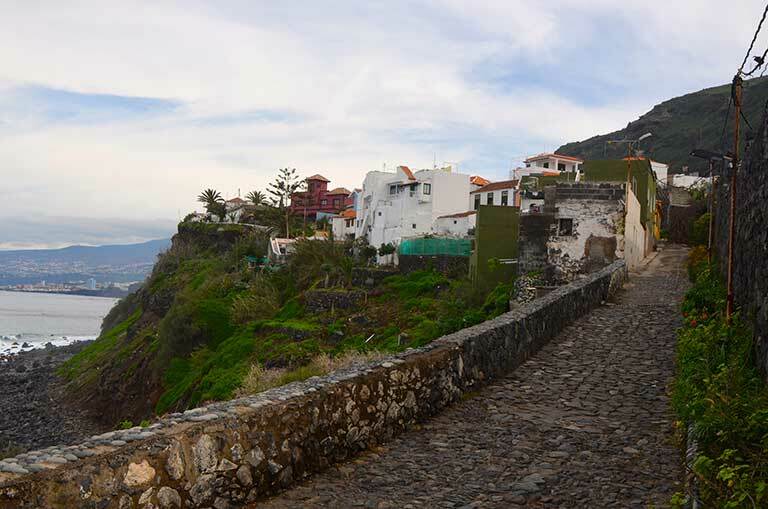 The village of La Vera is characterized by its location on the edge of the Barranco de Ruiz. La Vera is surrounded by beautiful farming country, where agricultural plots abound, still cultivated and producing vegetables, cereals, potatoes, etc. The ravine is a protected natural area, declared a Site of Special Scientific Interest and an interesting visit. It is steep and rugged and in some areas preserves pockets of evergreen laurel and thermophilic forest. Over the course of time it has been affected by the residents' agricultural uses, the southern part preserving the best examples of natural vegetation. It is also noteworthy for the presence of bird species such as the laurel pigeon, Bolle's pigeon, (endemic to the Canaries), the Manx shearwater and the forest bat. The stop will allow you to delve into the ravine and discover amazing views, and to get to know its most fascinating natural and cultural features. 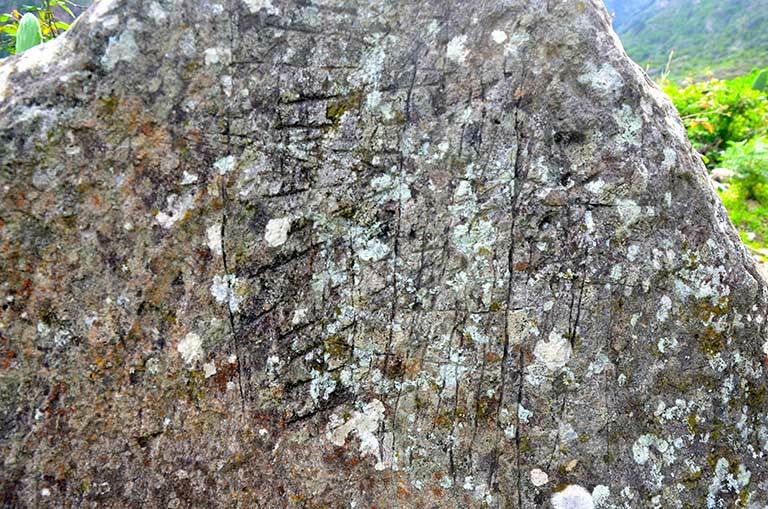 What is more, it is also a land steeped in history, where numerous archaeological remains of the aborigines have been found. Among the various interesting aspects of this stop you will come across what is known as Cruz de Los Dominguez (the Domínguez' Cross), next to a small group of houses called Orilla de La Vera (the edge of La Vera), and which is a real vantage point from which to admire the beauty of the ravine. 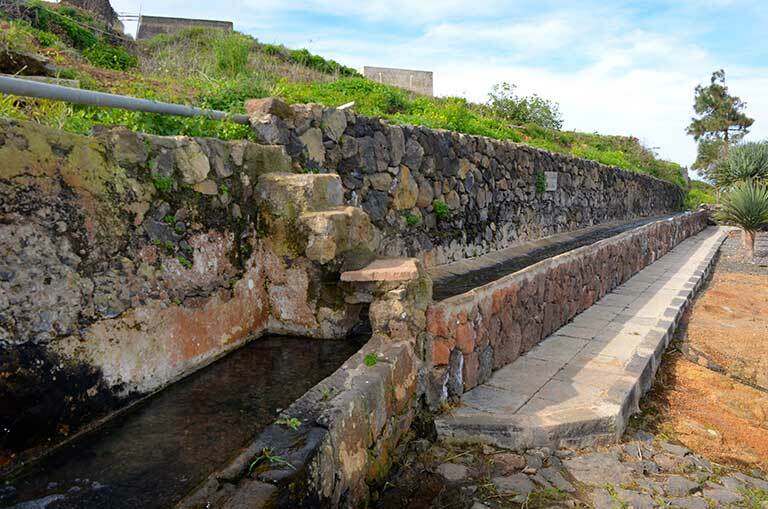 On this stop you will also have the opportunity to visit the old public laundry basin, one of the oldest water sources in the town, recently renovated and located less than a km from the Domínguez' Cross, at the side of the La Vera road. It forms an invaluable element of local folklore, reflecting the daily life of rural areas, and from the time it was built, such places were the meeting places for the local women who came to wash clothes and where they commented on and exchanged the different news and gossip of the goings-on in the town. Both the laundry stones and the Domínguez' Cross are much frequented places where footpaths through the ravine cross each other, among which one of the best-known is the path called the "Risco de Las Pencas" (cliff of prickly-pears). 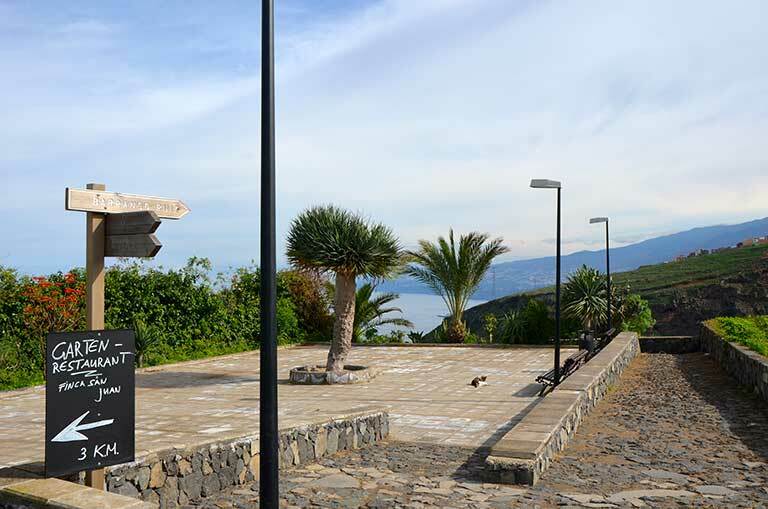 From this path you can admire the rich landscape of the ravine and the amazing natural and cultural heritage it contains. This is a traditional track of great importance to the residents since at one time it represented the only means of access for animals from San Juan to the neighbourhood of La Vera. To be exact, the track begins at the Fuente del Rey viewpoint, where you have to turn right onto a cobbled track. The trail descends with the Barranco de Ruiz on your right and on the left, water channels and pipes. It crosses the road from La Vera and laundry site and continues as far as the Domínguez' Cross. Then the road starts zigzagging down the Barranco de Ruiz to reach the Recreational Area of the same name. The next stop directs you towards the upper areas of the municipality of San Juan de la Rambla. The route surprises you with unexpected rural scenery, in which vegetable plots, many still under cultivation, follow one upon another, interspersed with traditional buildings. The views you can see from this point reveal a scene of great landscape value, which give you a close-up of the reality of these rural villages. The Atlantic, away on the horizon yet always in view, becomes an inseparable companion. The La Tahona Recreational Area, as it should, allows us to enjoy contact with nature, in a wooded environment, a forested area consisting mainly of pines. 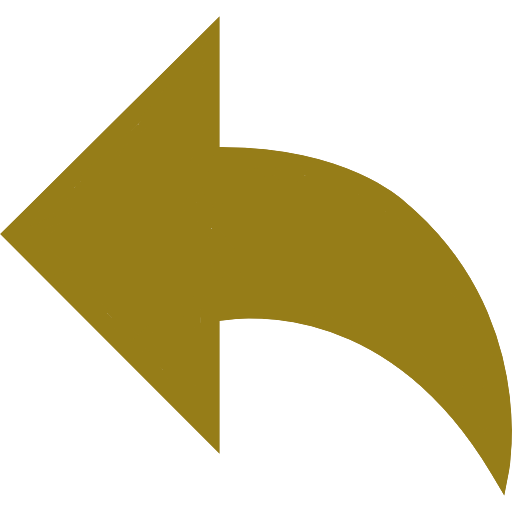 Dirección:Calle Real, 146. Icod El Alto. 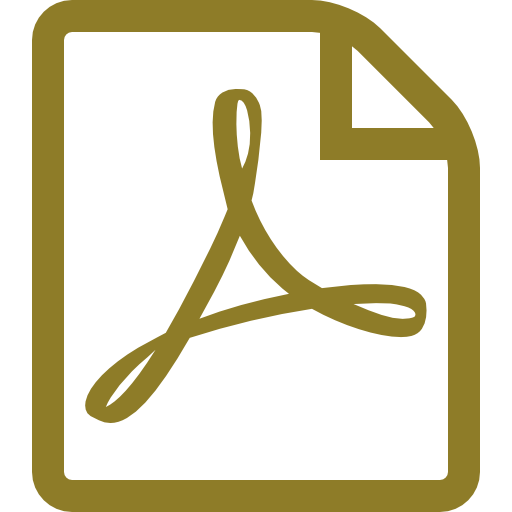 Los Realejos.